UPDATE: The Board on Dec. 6 approved of these refinements. The Board also directed Metro to conduct a separate Feasibility Study for a potential station at the L.A. River and Rio Hondo confluence site in South Gate to determine whether to advance it into environmental review. 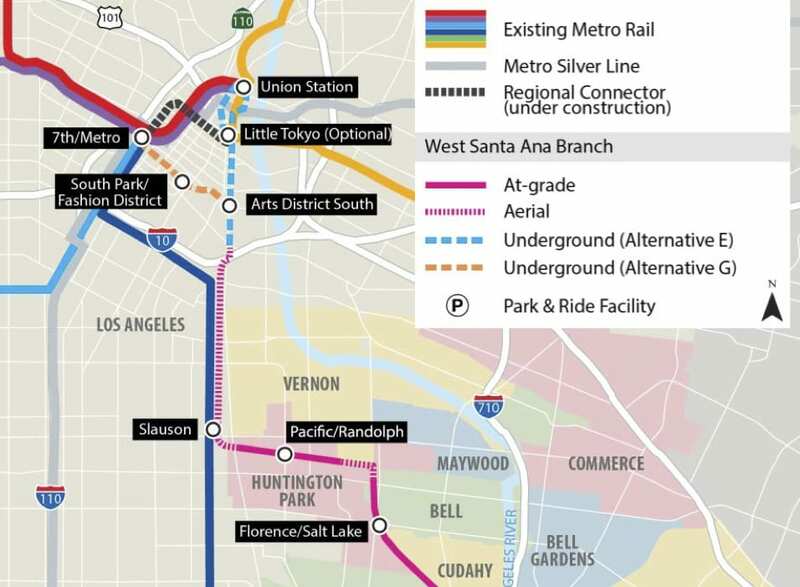 Planning continues to move forward for a light rail line to run between downtown Los Angeles and Artesia, a project known as the West Santa Ana Branch Transit Corridor. The rail line has funding from Metro’s Measure R and M sales taxes, as well as from the state. •The Washington, Vernon and 183rd/Gridley stations will be removed from further study because they’re too close to other stations and have limited ridership potential. In the case of Washington and Vernon, the vast majority of transfers from the Blue Line will occur at Slauson Station. 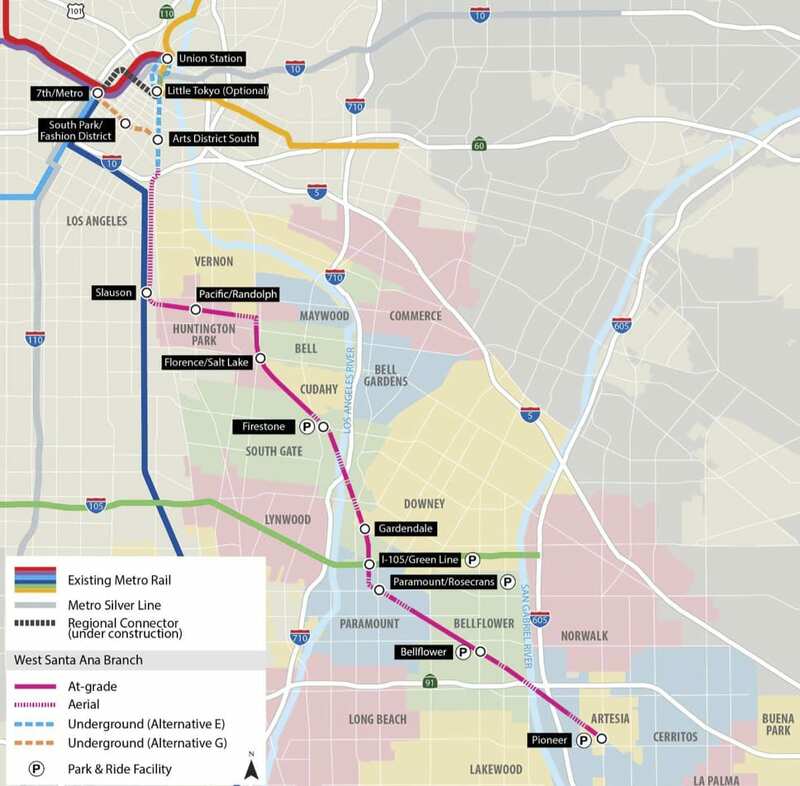 •The rail line would run on aerial structure that would begin on the north side of the 10 freeway and continue south to Slauson Station — running alongside the Blue Line in this stretch. •Five bridges over streets will be added to speed up the rail line and reduce car traffic impacts. Please see the project’s profile map below. •For the Downtown Transit Core option that is under study, a station at Pershing Square will be removed from further study. The sole terminus for that option will now be Flower and 8th. 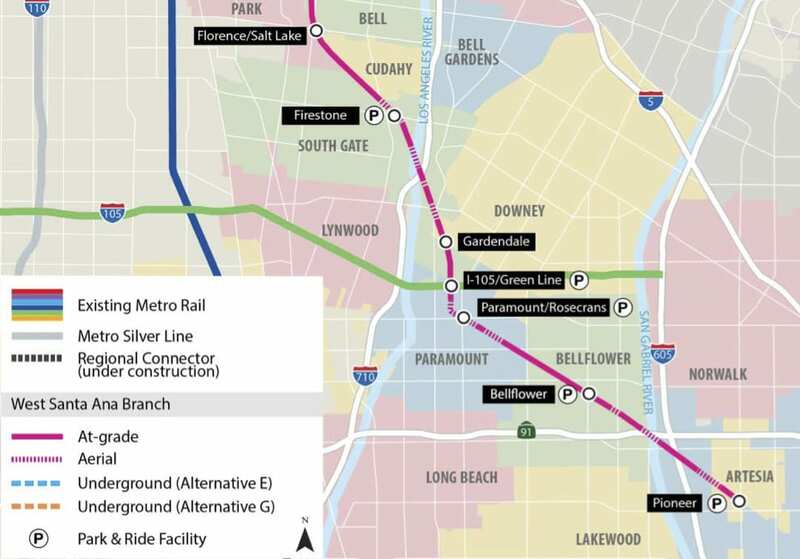 That location is adjacent to the existing 7th/Metro Center Station and would serve as a better transfer point between this project, the Red/Purple Line subway and Metro’s light rail lines running to Azusa (and beyond), Long Beach, East L.A. and Santa Monica. •The optional Bloomfield station in Cerritos will be removed from further study. A station at Pioneer Avenue in Artesia would serve better as a multi-modal transit hub. •In response to a motion asking Metro to study the possibility of using four-car trains on this project, staff determined that three-car trains on this line would have enough capacity in the year 2042 to handle expected ridership if the underground Alameda option (Alternative E) is chosen for the project. Staff found that capacity would not be adequate for the Downtown Transit Core option but that it would be better and less expensive to offer extra trains in peak hours between Slauson and 7th/Metro than build four-car platforms. •The Board will also consider a motion to add an optional station at the confluence of the L.A. River and the Rio Hondo in South Gate. Metro staff have also revised the potential cost of the project upward to $6.5 billion to $6.6 billion. The Measure M spending plan has $4 billion available to build the project in two phases, with $1 billion available prior to 2028. This project is also part of the Twenty-Eight by ’28 Initiative that seeks to complete 28 major projects in time for the 2028 Summer Olympics and Paralympics. Metro staff is currently studying ways the ’28 Plan could be funded and built. That includes possibly accelerating this project as a public-private partnership (P3). The private sector, however, must first have a better idea of what Metro wants to build — the main reason why it’s important to keep planning of this project on track. Why build Gardendale station only 0.7 miles from I-105 station? It seems to me that Imperial/Garfield makes much more sense for a station, since it will be elevated and would serve two transit corridors. By contrast, the Gardendale site has almost no transit connections and is on a relatively small street. Looking at the city borders, north of Gardendale Street where the station would go is in Downey, but Imperial/Garfield is in South Gate, which is already getting a station at Firestone. So it looks like we’re making bad transit decisions in the interest of earning political points, i.e. business as usual. I really think the line should have met Pershing Square perpendicularly, rather than Parallel. Hundreds of millions of dollars could be saved by putting the station and the interchange in the Pershing Square parking garage rather than excavating further. It also would allow the line to one day be extended to Echo Park and either out Santa Monica Blvd through southern Hollywood to WeHo to to Burbank. Why does the line going to union station preclude it from being extended to Echo Park and then to SMB and West? It still very well could be. It will be tunneled and will end on the western end of the union station plaza. All of the changes I can understand and agree with except for one. It’s a huge mistake to remove the 183rd/Gridley station. The mall and the auto dealerships on Studebaker are not only destinations but job sites. This area is also a terminus/transfer point for countless bus lines. Plus the mall parking lots could be used as park-and-ride lots. I get that Artesia deserves their piece of the pie and that the station at Pioneer is too close to 183rd but people will not be willing to backtrack to get to the mall. And please build to 7th and Metro. Union Station is a transfer point, not a destination. Build to the jobs. Agree with Chris. This area will likely still be suburban like for the next few decades. Workers park&ride to avoid the molasses freeways. Fail to see any appreciable parking at the Pioneer station location. heavy rail is obviously the best option. it’s a shame metro isn’t studying it. I’m glad I’m not the only one who thinks so. How is skipping the largest regional mall in the area and a source of thousands of jobs, in the Los Cerritos Mall, going to generate trips? Is there any intention of connecting to the OC Street Car project? Metro has talked about possibly extending the line and adding one more stop at Bloomfield/Del Amo. But LA county line, and thus Metro’s jurisdiction, ends at Coyote Creek. The OC Street Car only goes as far as Westminster/Harbor. If OCTA wants to extend their line that’s on them and up to OC taxpayers. The ROW sits mostly unused so perhaps one day in the far-off future we will have rail service from DTLA to Santa Ana like we had in the Pacific Electric days. Perhaps one day we’ll close the gap. So close, yet so far away. Metro Center option gets you to the middle of downtown and adds a new station in the Fashion District. Elevated adjacent to the Blue Line tracks? Both the P.E. and L.A. Railway utilized visual separation of their railcars as did every other transit operator in the twenty century . With the modern mandated computer systems that the MTA already use on both their rail and bus lines to monitor their vehicles the separation of the two lines on one track could be achieved with as little as one minute separation. This will be just another boondoggle being created by text book morons who have no practical transit experience. Putting this line on the same track as the Blue Line would impact scheduling on both the Long Beach/Foothill Line but also the Santa Monica/East LA line. That’s something the existing Flower Street joint section can’t handle. They don’t have to put it “on the same track”, but all the tracks should be elevated and connected to each other. This would not only improve the Blue Line, but also provide redundancy in case some track has to be pulled out of service. On daily basis, I suspect more riders would benefit from a direct connection to 7th Metro station rather than Union Station. Beautiful. Nice to see this project move forward. Scrap this whole project. It’s completely insane that at grade options are even been considered for this. The blue, gold, and expo lines are a complete disaster because of their at grade portions. Nothing should be at grade. Ever. This is for everyone’s safety, and for the overall efficiency of of the rail lines. It doesn’t matter if the areas are not heavily-trafficated or not. Someday, they might be. Think of how much faster the blue/expo lines could be if they didn’t have to top at traffic lights. Think of how much safer the gold line would be if it weren’t directly adjacent to an extremely busy freeway. Let’s be proactive about this and try to solve problems before they actually become problems. To be fair, I don’t think this line will have any “street running” segments as it follows an established railroad ROW in the places where its at-grade. So it will operate like the blue line does between Washington station and Willow station with crossing gate preemption and higher speeds rather than the way it operates along long beach blvd. or flower. But yeah ideally all of our rapid transit should be grade separated. Agree with all who say the downtown core option is smarter than Union. Also, echo sentiments on the Los Cerritos Center being a missed opportunity. As other echo, go where the jobs are. Running parallel to the Blue Line is such a waste. They should consider moving the line at least 5 miles east to gain new riders. Not having a closer stop at Cerritos Mall is a mistake and they should consider building it’s own park and ride lot since the Mall won’t allow commuters to park in their parking lot. For what its worth. I’m in support of ending the line at 7th/metro and adding a station in last unserved portion of downtown (the fashion district) and giving Little Tokyo a construction break after well over a decade. However, I know its more likely the Union Station route will get chosen and I think metro should get the Dodgers to throw some money to extending a subway to the stadium and provide a real alternative to the traffic game days create. It could also give people better access to underutilized Elysian Park. Then a future extension to Echo Park and Silverlake could be a possibility. A stop near MLK would be good if both Washington and Vernon are being dropped. I would agree but then really is it necessary if people can just use Washington or Slauson to transfer?? Dropping Washington and Vernon is a great idea considering the fact that real progress is being made on extending the current Gold Line to Claremont with three more stations after the current Azusa Pacific/ Citrus College stop. Also, a clear understanding of what policing entity governs over certain areas is needed because, I know for a fact that the LA County deputies working the policing from South Pasadena to Azusa, don’t put up with as much crap as the ones from the LAPD do. There’s also the hideous stuff I’ve seen of men actually urinating on light rail trains while this stuff is being recorded by the security cameras and no one is called to arrest the offenders? The current Blue Line takes a real long time as it is and I personally know that the Gold Line is far more efficient when they’re not doing the so-called maintenance stuff. 7th/Metro (alt G) would provide faster connections to the West Side by both Expo and Purple Lines. These would be important hone-to-work trips serving areas of affordable housing. I don’t see any comparable advantage for the direct service to Union Station. I’m going to echo again the 183/Gridley station should not have been axed. That area is a hotbed of activity and having two stops, one by the mall and the other on Pioneer will allow easy and walkable solutions for that whole retail and restaurant area. Having to schlep from Pioneer up to the mall is a burden for most people that they will decide it’s easier to drive. Besides, it’s the start/end of the line so despite the extra 1-2 minutes for the extra stop it won’t feel as sluggish as it would in the middle of the line as you do on the Expo Line. I hope this is being considered in conjunction with the LINK US plan. My thought would be use this as an opportunity to build an underground tunnel from Little Tokyo, potentially even four tracks, with a large multi-line station under the US Forecourt (could be in phases). That could then be directly linked to the Red/Purple lines for transfer and open up another for HSR / Metrolink / Amtrak and more room for the throat. 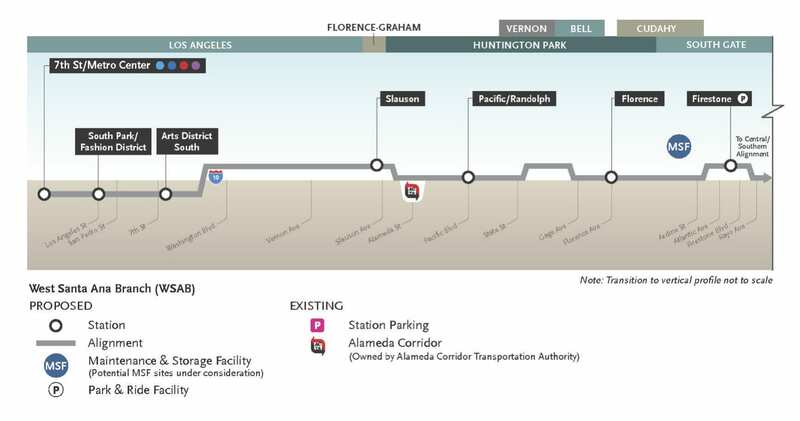 From a larger station under the Forecourt, the gold line can then go under Alameda and surface to go to Chinatown. The new line could eventually be extended north to Glendale, on to Burbank Airport and eventually meet up with ESFV line going down San Fernando. Building underground light rail capacity at US now would provide a lot of flexibility as all of these lines develop. We want stations at Santa Ana St/ Salt Lake, Lakewood Blvd and 183/ Gridley in addition to the ones proposed. And a station at the river confluence would be a complete waste of money and useless. The crowds at 7th/Metro Center are on the platforms, and no number of additional passegeways will change that fact. Directing more people to the same station is dangerous and outright insane. True, the Regional Connector will take some riders away from this transfer, but remember than many more will be coming with the extension of the Purple line to the West side. 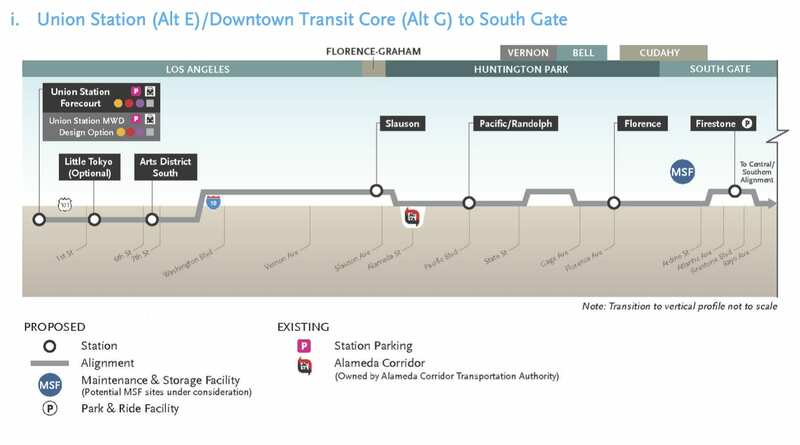 Moreover, once the Connector opens, many current Gold line riders will probably find the transfer point at 7th/Metro Center more convenient than that at Union station (given how bad the latter is). So, no, the Regional Connector will NOT provide a sufficient releif in the long run, and no, they should not bring yet another line to 7th/Metro Center. Before I go off on my long rant: This should have been a Metrolink commuter rail line, cause at least at that point, we could have actually had a single, continuous line to Santa Ana, with actual potential extensions to Downtown Disney and (North) Huntington Beach, that’s all I say to that. Also, unless there is enough ridership to pack trains coming every 5 min, in both directions of this line, people REALLY need to stop advocating heavy rail for this, cause it only makes a much sense as the BRT idea (in other words, it doesn’t). Wow, I am surprised how near-sighted people are looking at this instead of realizing there is a much bigger picture to this. “Union Station is a transfer point and not a destination point.” – uhh, okay then. . . LETS MAKE IT A DESTINATION POINT THEN!! How is continuing to treat Union Station as a transfer point going to solve that problem? No matter how many more rail lines you’re going to add to 7th/Metro, it’s no longer going to make it a better place. There is so much potential for development around Union Station that I’m surprised no one has bothered looking into that. Now let’s see how much more land there is that can develop around 7th/Metro. I supported a 5th/6th/Flower Station, with an underground portal to connect both stations as something like that made more sense, not yet another line terminating at the same station. “This route will finally bring a station to the fashion district” – okay, divert the line to serve this underserved area and then continue to Union Station, simple. Will it add more time and cost? Sure, but hey considering how few stations this line already has, I guess 1-2 min can still keep end to end run times to potentially under an hour. “Diverting the line to 7th/Metro will give Little Tokyo residents relief after a decade of Construction.” – on one hand, yeah, it’s kind of difficult to argue there. Metro could simply bypass Little Tokyo altogether, but on the other hand, a station in Little Tokyo would not only provide a connection to the Regional connector, but could lay the foundation for a Downtown Circulator Line, given that a station at Washington will be necessary. 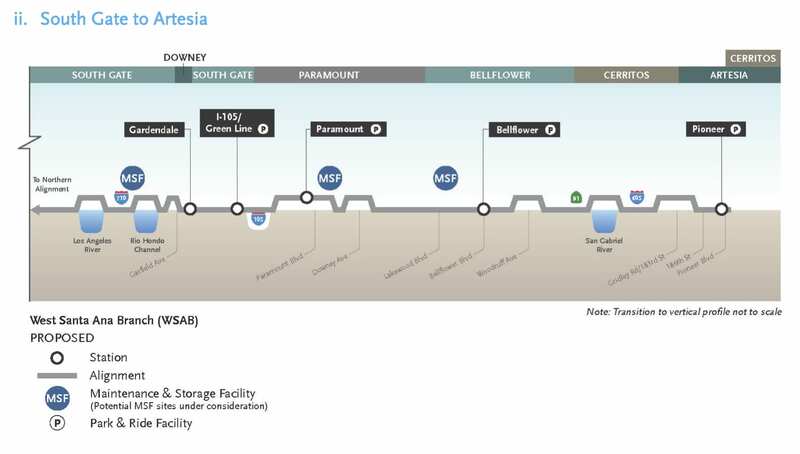 Lastly, has no one thought that a Union Station Route can be used as a way to pressure Metro to finally build a rail line along the Harbor Subdivision to LAX, finally connecting both Downtown and the Airport? Think about it, build this to Union Station, add to the fact that by this point there is already a Line built to LAX starting at Crenshaw, connected to another rail line that will be extended to Torrence. This way after constructing just a few miles of track along the harbor subdivision with Grade Separation at Central, Broadway, Vermont, Western and Crenshaw, while still allowing to connections to the Vermont BRT/HRT and the Silver Line, and even the Blue Line can be connected to this for a one seat ride to the Airport from 7th/Metro. How about instead of focusing on the money, or where “it already makes sense,” we focus on the fact that this line actually has the potential to build a foundation much more than it intended to? Just a thought. Build it right or don’t build it at all. Building this directly to 7th/Metro is simply putting a band-aid to the problem plaguing the Blue Line and will only give Metro to use money an excuse to not expedite an obvious solution to that problem. On another note, metro needs to take advantage of how straight much of this route is and make sure trains can run at 65 mph wherever possible. If it were heavy rail, you can be sure that 70 mph would be targeted here, so why not at least use LRT to its full potential. So far, the green line is our only LRT line that goes this fast and some of the at-grade crossings shouldn’t be a hindrance to that since other systems often run at these speeds even on at-grade segments such as Dallas DART and St. Louis MetroLink.